One hundred frail and elderly patients with calcific aortic stenosis have been given a new lease on life with a minimally invasive heart procedure being performed at Macquarie University Hospital. Transcatheter Aortic Valve Implantation, or TAVI, is a relatively new procedure in Australia. However, Macquarie University Hospital surgeons have now performed 100 of these, giving them significant experience in this complex procedure. When it comes to cardiovascular health and longevity, nothing is more powerful than engaging in the simple daily activities that help people live longer and the evidence to support this is now very robust. When the first pacemaker was invented and used in man 1952, it was connected by thick wires to a battery on a trolley. Modern pacemakers are sophisticated minicomputers which can be packed into a metal box the size of a flattened walnut. When a decision is made to implant a pacemaker, usually for a slow heart rhythm, the Cardiologist will assess a number of things. Swelling that persists can be difficult to diagnose. However, lymphoedema is often not considered and the diagnosis of primary lymphoedema usually presenting in the foot is often delayed for years. For patients presenting after cancer surgery and lymph node excision, the diagnosis may be relatively easy, yet early referral for treatment remains crucial. Reversal of limb volume increase and maintenance is only possible before the permanent lymphoedema-induced tissue changes of fibrosis and fat accumulation have occured. There have been recent changes in the risk and management recommendation for lymphoedema in recent times, as anaecdotal (often quite reasonable) advice has been challenged by research. 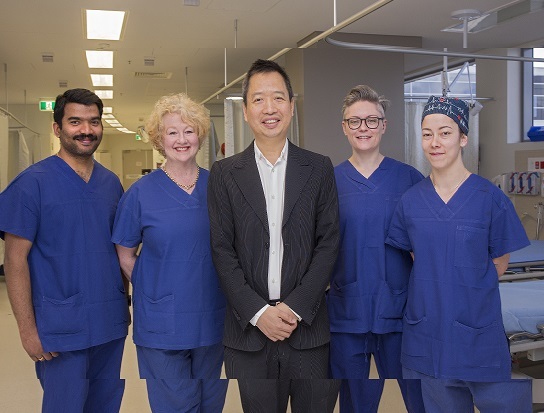 Macquarie University Hospital has recently invested in the da Vinci surgical system, an advanced robotic surgical tool to boost the hospital’s oncology, urology and gynaecological capabilities. Our doctors will initially use this system for urological cases, with a focus on prostate surgery. However the technology will eventually be utilised by a number of specialities. Around 20,000 new cases of prostate cancer are diagnosed in Australia every year and one in five Australian men will develop prostate cancer by age 85. It is the most common form of cancer and the second most common cause of cancer deaths in Australian males. A relatively common, but often unrecognised, breast condition in young women is “tuberous” or “constricted” breast deformity, a congenital condition in which the breast fails to develop fully during puberty; the breasts may develop unusual shapes as well as develop differently to each other.